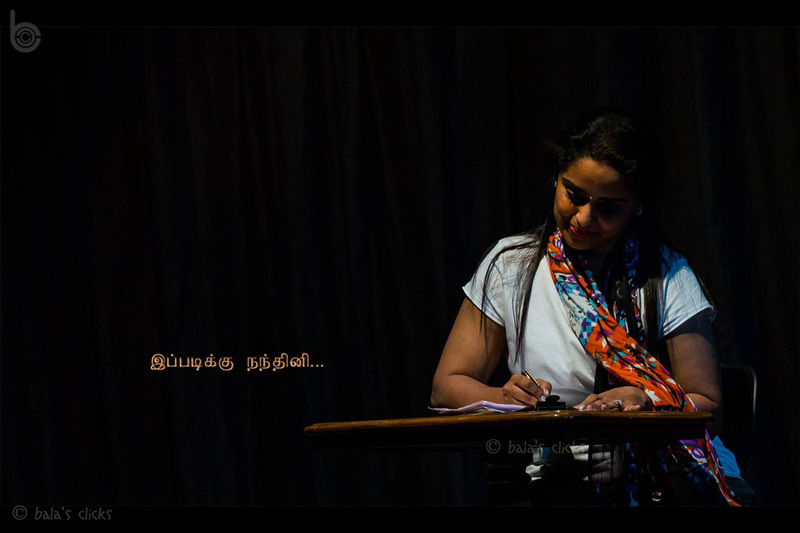 “Ippadikku Nandhini” is the latest play by Shraddha. Story and Dialogue is by S.L.Naanu (Kathady Ramamurthy’s Drama Troup). After a tasty Masala Dosa and Curd Vada in the Woodlands Restaurant, I went inside to see the play in Narada Gana Sabha, Alwarpet. 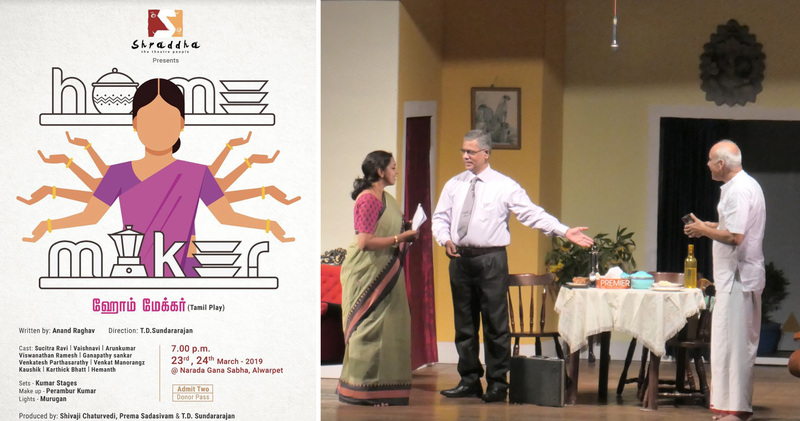 This family play is centered around a young couple Nandhini (played by Lavanya Venugopal) and Vignesh (played by Anand Ram). Due to biological problem with Nandhini, the couple couldn’t have a baby. After a bit of hesitation by either of them to share this news to the other, they decide to go for adoption. Hailing from an orphanage Nandhini finds the idea easy and quickly selects a young boy in a local orphanage. Unfortunately when they approach the office for beginning the process they learn that some other couple has already adopted the boy. Returning dejected Nandhini spots a kind and warm grandfather Swaminathan (played by T.D.Sundararajan) telling stories to children there. Instantly she decides to adopt the couple (Swaminathan and Maragathavalli) as her parents against the wishes of Vignesh. I was reminded of a similar act of adopting senior citizen in S.Ve.Shekar’s Kuzandhasaamy comedy play. 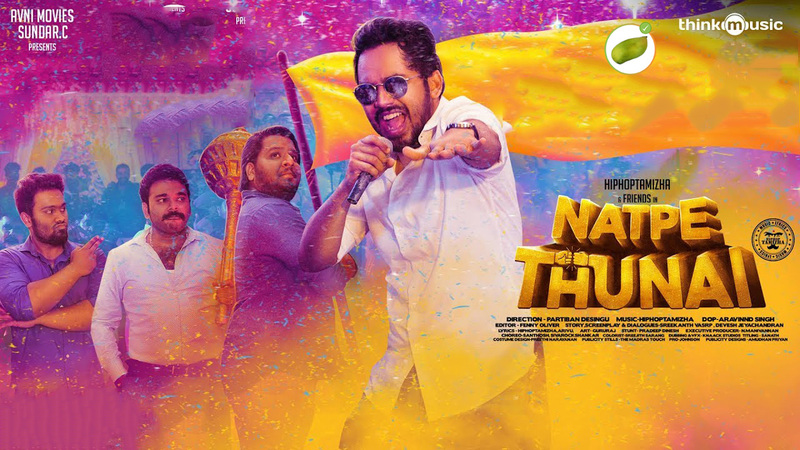 As a birthday gift Vignesh gets Swaminathan a chance to do a motivational talk in TV, this makes Swaminathan an instant worldwide hit and jet setter. The young couple starts feeling lonely after experienced short lived parental love. Fine performances by all the artist on stage. 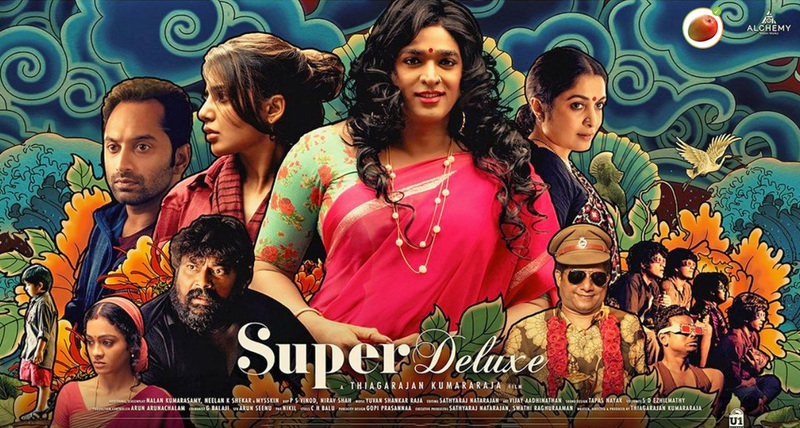 I was impressed by natural and apt acting by Lavanya Venugopal and Anand Ram. They both appear as a perfect couple on stage and they are got registered firmly so in my mind. After the play I had a chance to congratulate in person Anand Ram when he had come to the same Woodlands restaurant where I stopped again for a return refill. The stage set and costumes were brilliant too.